I learnt about this musical almost 9 years ago now when I studied the 20th Century American Musical during my Performance Studies A level. I’ll be honest, I don’t remember a lot about what I learnt at A levels, but this musical stuck with me. And it was even better than I hoped for. This version has been ‘reimagined’ and ‘gender reversed’. In the original the main character, Bobby, is male. In this version Bobby is female. Their reasoning is to modernise it but I think it would have worked fine as it was! Either way it was still a great show. 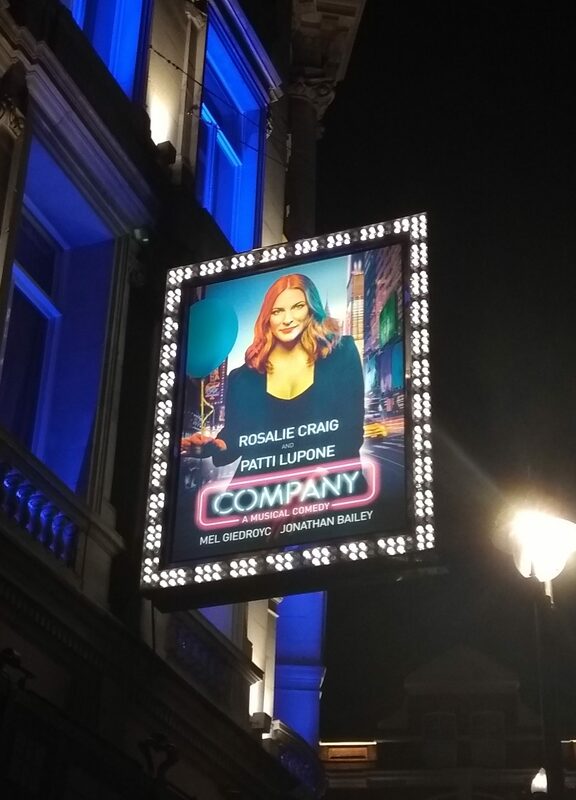 Company is the story of Bobby celebrating their 35th birthday and the company of friends she has around her. The thing is, that all of her friends are married, and they are worried about her singleness. This musical sips back and forth around her birthday, not following a linear timeline, to show scenes of Bobby with each of her couple friends. But it’s hilarious and the songs are brilliant. We see the realistic yet comical relationship between Paul and Jamie, where Jamie has a panic attack about getting married, singing the brilliant ‘Not Getting Married Today’. We hear ‘Sorry,Grateful’ when one gets asked if they regret getting married- ‘you’re always sorry, you’re always grateful’. And many witty remarks about being married; ‘it’s the little things you do to together that make marriage a joy’ ‘getting a divorce together’. Plus some hilarious scenes where one couple try to compete with each other in the ways we all know to be true- correcting every little fact shared at a dinner party, outdoing each other when practicing the jujitsu moves, outdoing each other by both ‘giving up something’ but clearly not having given it up behind each other’s backs. The music throughout has threads of the first song ‘Company’ linking it all together seamlessly. This version on the West End also had some big production value with lots of amazing sets sliding back and forth throughout the stage. This musical comedy is definitely one to see, even if it is a bit more abstract and different to the standard ones. You can buy ticket now at any of the links below.